Lately, I am trying to reduce stress. I’m cutting back on caffeine, but it’s not doing much. I think I actually need to cut back on reading the news. Maybe I should just turn off the TV and stare at a blank wall until after the November elections. Or, I could find something else to do with my spare time. I heard about this new game, which is hardly a game at all. It’s Japanese. Very calming. 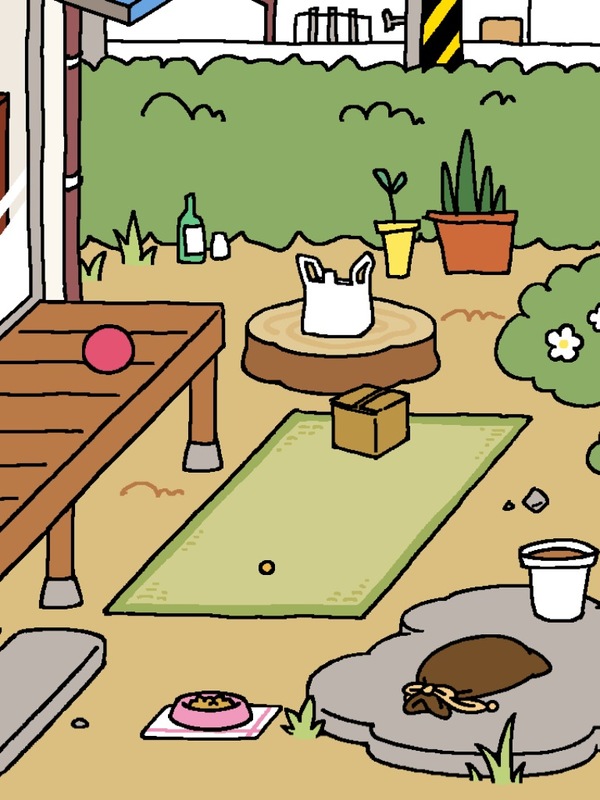 Neko Atsume is a cat collecting game. You have a cartoon back yard, which you fill with cat toys. Then, animated cats come, and you take pictures of them and store them in an album. That’s it. Nothing else happens. 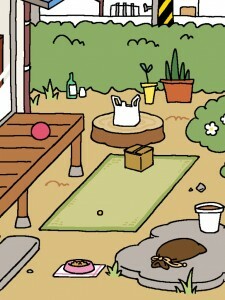 This is the game equivalent of a Zen garden, but with kitties instead of raked sand. I never meant to be a cat person, but judging by the number of them sleeping on the desk as I type this (2) I must be good at cats. There is also a dog under the desk. And, in case the IRS is reading this, I consider the pets scattered all over this room to be part of the writing process and not a sign that I am using this room for something other than its designated purpose. Can you tell we just did taxes? That’s why I’m trying to cut down on stress. But Neko Atsume looked relaxing. So, last night, I downloaded it to my Ipad. It took a while. I had trouble typing because I had a cat in my lap, and another one hopping on and off my chest. But I went to the app store, and it was free. Since I am about to send all my money to the federal government, free is relaxing. I got a cartoon yard, and put a red rubber ball and some cat food in it. I closed the game and reopened, as suggested. Obviously, it takes a while. I came back in a half an hour. How about better food? And a cardboard box. Cats love those. A plastic bag? And a heating pad. Maybe it’s cold in cartoon Japan. I start complaining on Twitter, and my friend Tara assures me that these things take time. Give it fifteen more minutes. When I come back, the food dish is empty, and so is the yard. Obviously, there are cats somewhere. I replace the cat food with sashimi. It disappears. Still no cats. Back to cat food, since I no longer have game currency to buy luxury entrees. This is gone, too. The cats are supposed to be leaving me presents of fish in gratitude. But so far, they have left me squat. The DH thinks, maybe I have animated raccoons. I think, pretty soon, my Ipad will begin smelling like cat pee. But I won’t know why, because there still won’t be any cats. And don’t forget, Coming March 1, a book that also does not have any cats. (Just horses and deer).